Sitting, Standing or Hanging Upside Down Like a Bat | Does This Font Make Me Look Fat? 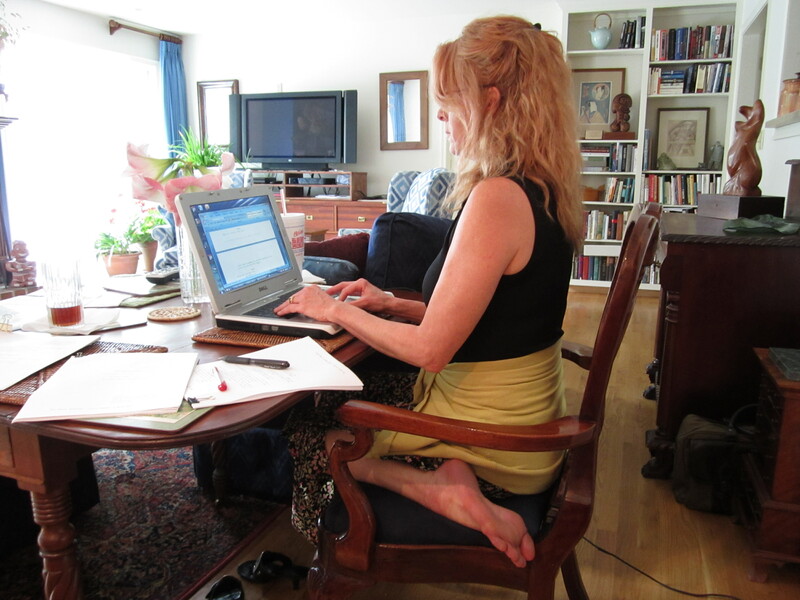 When Laura and I write together we sit at the table in my family room. If we are working on a script, it is she who is typing at the computer. She takes off her big girl shoes (the ones with 6” heels) and sits on her heels, back erect, in a straight back chair. I don’t last in my straight back and pull up a wingback chair. I’m in “thinking and talking mode” so I don’t have to have excellent computer posture. Sometimes I knit while we work. I knit kid’s sweaters for a Guidepost Magazine project. They collect the sweaters and send them to needy children all over the world. Trust me, these sweaters are brainless knitting. I don’t have to think about what my hands are doing. The problem is I have to sew the two pieces together when I am finished; it’s much easier to start a new sweater. One winter, as Laura and I wrote a script, I promised myself I would not start another sweater until I sewed the one’s I had finished. Twenty-two sweaters later the script was finished and a big box was on its way to Guideposts. When I write alone, I sit at my desk in my incredibly messy office where I mostly know where things are. The photo below is on a good day. Occasionally I sort through the drifts on my desk and find something I should have taken care of last week – or last month.What did we do before Post-it Notes? Somehow the chaos in my peripheral vision isn’t a problem. My husband pays the bills. He’s much more organized, Thank God! My copy editor friend, Jeanne Pinault, has a standing desk. I am intrigued with that idea. Don’t your legs get tired? Your feet hurt? Recently on FaceBook I saw postings from people who were working while they walked (slowly) on a treadmill. Even more intriguing. I can see standing and typing at a computer, but walking and typing? I’d be flung against the wall. Sitting and knitting may be about the only multi-tasking I can do and write (with Laura typing). But at my desk my back does get tired. I’m in the process of installing a yoga sling so I can hang upside down like a bat when I need to clear my head and stretch my spine. Pictures to follow, I promise. Jeanne Pinault also shared with me her affection for Calico Critters. These are tiny animals, with moving arms and legs, dressed in tiny human clothes. Jeanne has her Critter family on her standing desk and rearranges them every morning before she starts work. She gave me a bunny mother and father who now reside in an old glasses case that sits just below my monitor. Looking at them makes me smile. If I am writing something scary, I turn them to the wall. One day a package arrived in the mail. Inside was a baby bunny in a lacy skirt. Jeanne had tucked in a note. “Mala, she was hiding in the wall clock and just emerged to inquire about her kinfolk. She’s a little the worse for wear but winsome withal. Love, Jeanne.” Now the family is reunited. 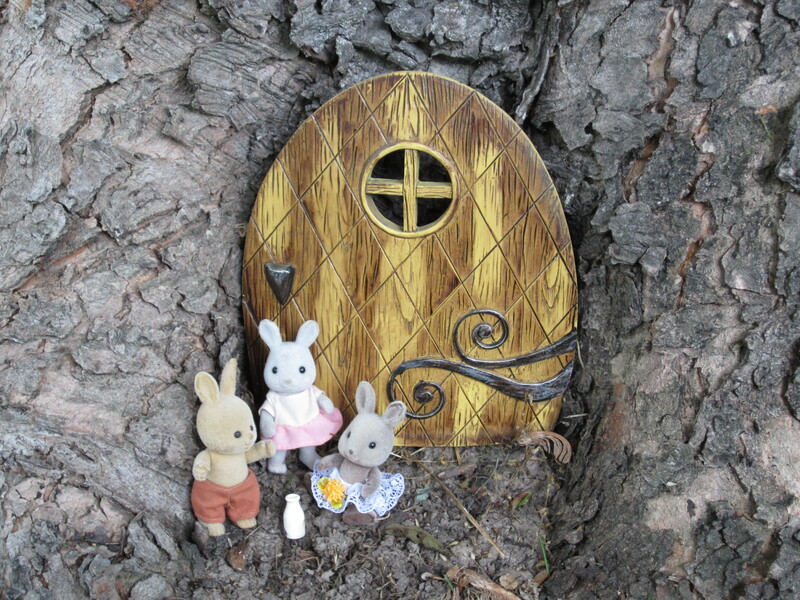 I posed them standing outside an elf door in one of my old maples.Critters, like writers, need to get outside once in a while. Well, you guys are great. My little studio has a light box for my cartoons, mockups where I do models of scenes in my novels, lots of animal pictures, and everything I can mount of my Eastern Shore past. My Great Grandfather’s battle flag was taken down and was replaced long ago with the original Republic of Vietnam flag given to me after the war, Sooner or later it all goes into a book or two. And I take off my shores too, Laura, like we both learned on the shore. Just read this again. Love it. Especially now, since I’ve joined the blogging world. 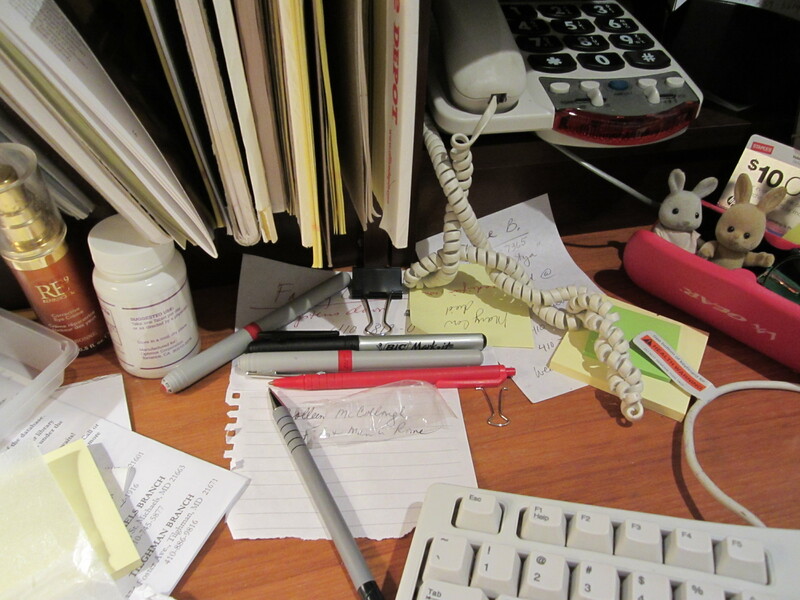 Thanks, Mala, for making it OK to have a messy office.